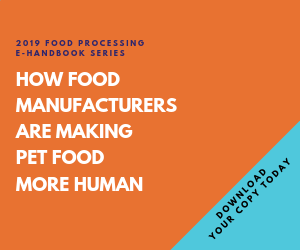 With $15 billion at stake in the United States alone, major food companies have been extending their reach into the pet food market. Nestle bought Purina and formed Purina Petcare Co. Brands include Fancy Feast, Alpo, Friskies, Mighty Dog, Dog Chow, Cat Chow, Puppy Chow, Kitten Chow, Beneful, One, ProPlan, DeliCat, HiPro, Kit’ n’ Kaboodle, Tender Vittles and Purina Veterinary Diet. Del Monte in 2006 bought Meow Mix from an investment group, and Milk-Bone and other pet brands from Kraft, to suddenly become a billion-dollar pet food company. Other brands include Gravy Train, Kibbles ‘n Bits, Wagwells, 9Lives, Cycle, Skippy, Nature’s Recipe, Pup-Peroni, Snausages and Pounce. Despite Mars Inc.'s reputation as a candy company, Mars North America’s biggest acquisition was the 2006 purchase of Doane Pet Care. While largely a private-label manufacturer, Doane added 22 manufacturing plants to a Mars portfolio that already included Pedigree, Whiskas, Cesar, Sheba, Goodlife Recipe and Greenies. Procter and Gamble ate The Iams Co. back in 1999 and introduced the Iams and Eukanuba brands into supermarkets. Colgate-Palmolive did likewise when it bought Hill’s Science Diet, with brands that include Hill’s Science Diet, Prescription Diets and Nature’s Best. With Doane now part of Mars, leading private-label pet food manufacturers are Diamond Pet Foods, Camarillo, Calif., and Streetsville, Ontario-based Menu Foods – which gained notoriety during this year’s melamine scare.